Heart failure, also called congestive heart failure, is a condition in which the heart can't pump enough blood to meet the needs of the body's organs. The heart keeps pumping, but not as efficiently as a healthy heart. Usually, heart failure reflects a progressive, underlying heart condition. How does heart failure affect the body? Heart failure can affect the right side of the heart, the left side of the heart, or both sides. When the right side of the heart begins to function less efficiently, it is unable to pump much blood forward into the vessels of the lungs. Because of the congestion in the right side of the heart, blood flow begins to back up into the veins. Eventually, swelling is noticed in the feet, ankles, lower legs, eyelids, and abdomen due to fluid retention.When the left side of the heart fails, it is unable to pump blood forward out to the body efficiently. Blood begins to back up into the vessels in the lungs, and the lungs become stressed. Breathing becomes faster and more difficult. Also, the body does not receive enough blood to meet its needs, resulting in fatigue and poor growth in children. The severity of the condition and symptoms depends on how much of the heart's pumping capacity has been affected. The symptoms of heart failure may resemble other conditions or medical problems. Always consult your child's health care provider for a diagnosis. Chest X-ray. A diagnostic test which uses invisible X-ray beams to produce images of internal tissues, bones, and organs onto film. Electrocardiogram (ECG or EKG). A test that records the electrical activity of the heart, shows abnormal rhythms (arrhythmias or dysrhythmias), and may detect problems with the heart muscle. Echocardiogram (echo). A noninvasive test that uses sound waves to evaluate a study of the motion of the heart's chambers and valves. The echo sound waves create an image on the monitor as an ultrasound transducer is passed over the heart. Cardiac catheterization (cath). An invasive test that introduces a small catheter into the heart from the groin or arm. This allows the measurement of various pressures inside the heart to aid in the diagnosis of heart failure. In addition, biopsies of the heart tissue may be obtained in order to determine the underlying cause of heart failure. If heart failure is caused by a congenital (present at birth) heart defect or an acquired heart problem such as rheumatic valve disease, surgical repair of the problem may be necessary. Medications or pacemakers are often helpful in treating heart failure initially. Eventually, medications may lose their effectiveness and many congenital heart defects will need to be repaired surgically. Medications may also be used after surgery to help improve heart function during the healing period. Digoxin. A medication that can help the heart beat stronger with a more regular rhythm. Diuretics. Helps the kidneys remove excess fluid from the body. Potassium-sparing diuretics. Helps the body retain potassium, an important mineral and electrolyte that is often lost when taking diuretics. ACE (angiotensin-converting enzyme) inhibitors. Help to dilate the blood vessels, making it easier for the heart to pump blood forward into the body. Beta blockers. Decrease the heart rate and blood pressure, allowing the heart to pump more efficiently. Cardiac resynchronization therapy, or device therapy, is a newer treatment for heart failure. Device therapy uses a special type of pacemaker that paces both sides of the heart simultaneously to coordinate contractions and improve pumping ability. For more specific information regarding heart failure treatment, consult your child's health care provider. We provide personalized care for babies and children with heart failure, including advanced VAD techniques and heart transplantation. 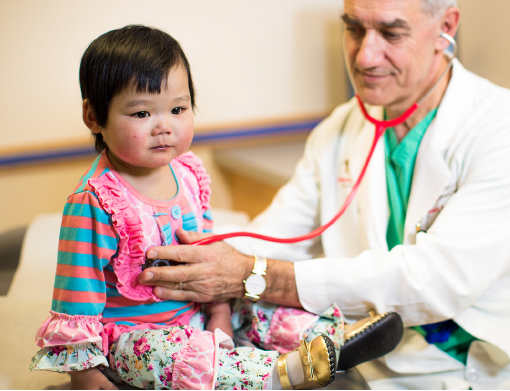 The pediatric heart experts at Children’s National in Washington, D.C., provide advanced care for unborn babies, children and young adults with heart conditions. Our expert pediatric heart team, including more than 40 subspecialties, offer advanced heart care and excellent outcomes for thousands of children every year. Teresa, 2, was diagnosed with cardiomyopathy and waited on the Berlin Heart EXCOR® Pediatric Ventricular Assist Device (VAD) for nine months while she waited for a heart transplant. Her heart arrived on Christmas Day. Routine transthoracic echocardiography is the most common test used in children, fetuses, and newborns to diagnose or rule out heart disease or to follow children already diagnosed with a heart problem.